Et Verbum: Jesus Christ the king of our hearts: elevations on the most Sacred Heart of Jesus Part 17. 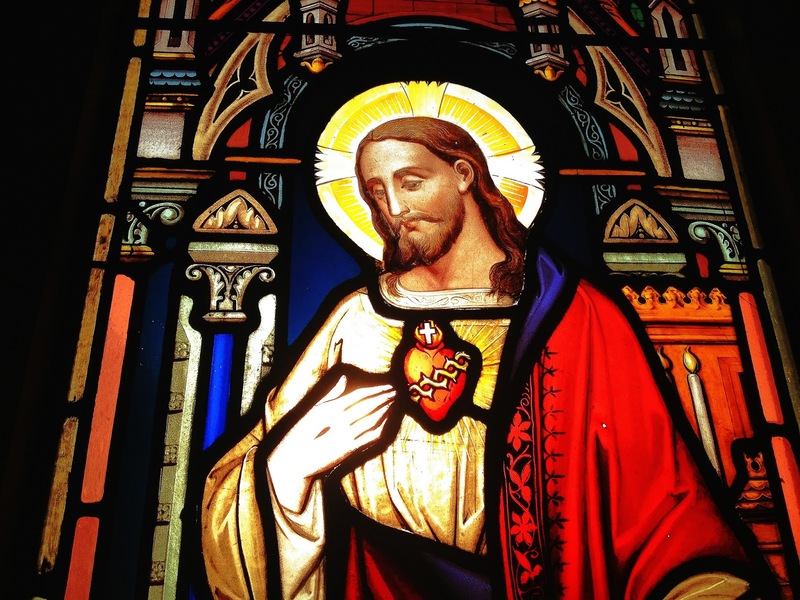 Jesus Christ the king of our hearts: elevations on the most Sacred Heart of Jesus Part 17. MANY are the prerogatives with which it pleased the eternal Father to enrich the most holy soul of Jesus Christ so that He might worthily, from the beginning of His mortal life, fulfill His high office of King of our hearts. Among these prerogatives the first that calls for our attention is the abundance of wisdom and heavenly knowledge which the Holy Spirit poured into His soul from the moment of His conception in the womb of our blessed Lady. In that blissful instant the soul of our most loving Lord was filled with all the knowledge which could adorn it and make it more able to exercise its sweet and strong rule over the hearts of men. to the bottom of that treasure of generosity of which our heart is capable, provided it be willing to put it out, while, on the contrary, He measured that abyss of wickedness and malice in which we can sink if we choose the way of evil. All, then, that belongs to us, both within and without, even if it be a mystery to our own eyes, was seen through and through by the penetrating gaze of Jesus. No consideration of any one individual person hindered Him from the perfect knowledge and consideration of another, however many human beings there were or were going to be on the earth. Now, the reason of this vast knowledge in the soul of Jesus Christ is none other than the illumination of the divine Word who knows all things, sees all things, and penetrates all things. The Word, then, hypostatically united to the most holy soul of Jesus, communicated to it, by means of that knowledge called infused, a large share of His infinite wisdom and knowledge. Beautiful are the verses in which Dante has expressed this theological truth: "Thou holdest that unto the breast where-from the rib was drawn to form the beauteous cheek for whose palate all the world doth pay, and unto that which, thrust by the lance, made satisfaction both for past and future, such as to turn the scale against all trespass, such light as human nature may receive was all infused by that same Worth which made the one and the, other." Marvellous indeed is the treasure of knowledge in the soul of Jesus Christ. This knowledge far surpasses that of the highest among the angels, because to no angel, not even to the seraphim and cherubim, was given so great a dignity and power over the hearts of men. Oh, how joyful we should be in knowing that there is a Man like ourselves in nature but immeasurably our superior in grace, who knows perfectly and penetrates all our thoughts, even the most hidden, who sees all our wishes, who measures with His mind's eye our miseries, our sufferings, our apprehensions. Nor does He know these things out of vain curiosity, or for the pleasure of beguiling Himself with so varied a sight, but in order to display His love for us, to be sorry for us, to help us, to en courage us to do good, to keep us out of harm. In this fashion, then, the Father did enrich the soul of Jesus, King and Center of our hearts, with a knowledge almost infinite, so that He could be solicitous for each of us, knowing all our needs and imperfections. We may, then, justly invoke Him: "Cor Jesu, in quo sunt omnes thesauri sapientiae et scientiae" —"Heart of Jesus, in which are all the treasures of wisdom and science." Be Thou blessed, O most sweet King of my heart, for the perfect knowledge Thou hast of me. I should be ashamed, indeed, I so wretched, so impure, so imperfect, of being seen and known by Thee who art so great and beautiful, so holy and immaculate. But as I know that Thou makest no use of Thy knowledge save to pity and help me; and, in spite of my unworthiness, to love me always more, there fore I am glad to be the object of Thy consideration. And beyond that, confiding in Thy goodness, I myself open my heart to Thee. I show Thee all my wretchedness, all the wounds of my soul, all my sorrows, all my difficulties, all my dreads, all my fears, as to my most dear King and Lord. Thou art the most skillful Physician of my soul who at a mere glance sees all my diseases, knows all my sufferings, beholds all the tempests of my heart. At the same time, with equal ease, Thou canst cure my evils and bestow on me perfect peace and tranquillity in the full conformity of all my affections with the most just, most exalted and most loving will of God. 1 "Paradise," translated by P. H. Wicksteed, Canto XIII, v. 37, foll.